I was walking back across Union Square in San Francisco late one afternoon after visiting the brand new Apple Store Union Square on it’s opening day, when I turned around and looked up Powell Street. The light was beautiful, catching the sides of the buildings in the distance, the steep street undulating it’s way up to the horizon. As I stood there a cable car rumbled past, working it’s way up the hill. I had my iPad in my hand so I lifted it up and snapped a picture as the cable car whizzed by in front of me. That picture served as the inspiration for this painting. To create the digital painting I used the new Corel Painter 2017 on an iMac with a Wacom Intuos Pro M pen tablet. 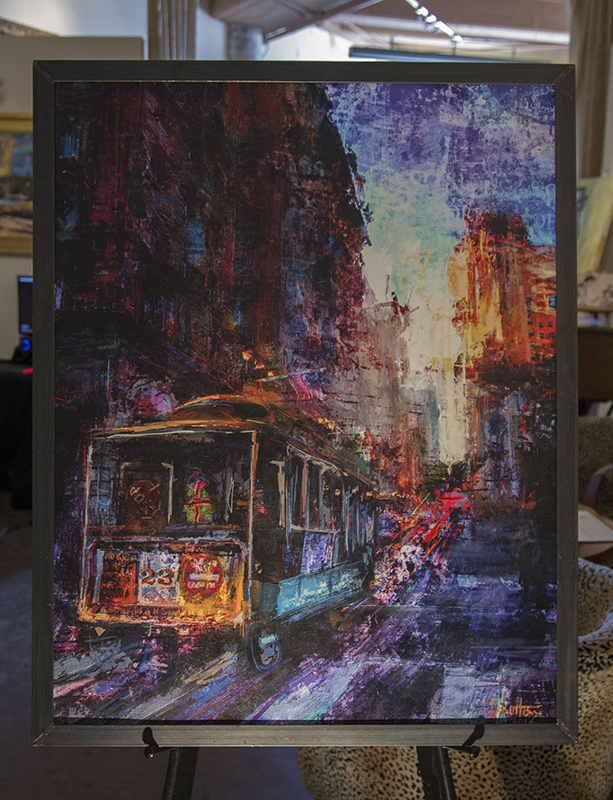 I then printed it out on canvas and worked into the surface with acrylic gels and paints. 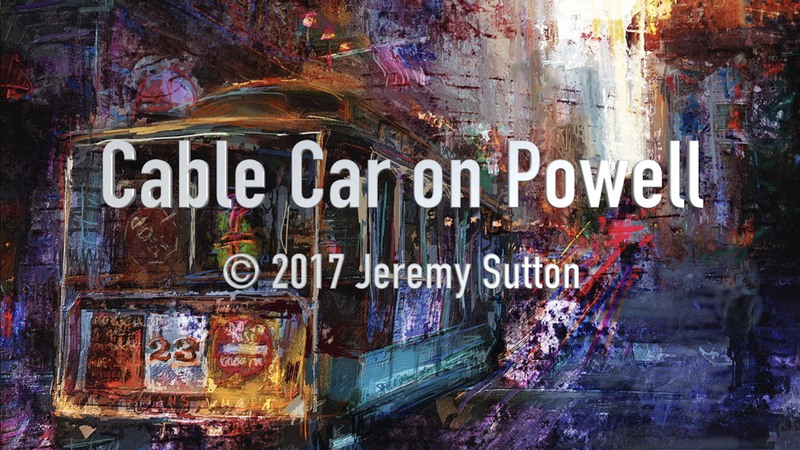 If you would like to learn the techniques and tools in Painter 2017, including the new Texture Painting and Dab Stencils, that I used to create this, then please join my subscription-based educational web resource PaintboxTV.com, and click on the Cable car on Powell video tutorial (you’ll need to be a PaintboxTV subscriber to view the video on this link). 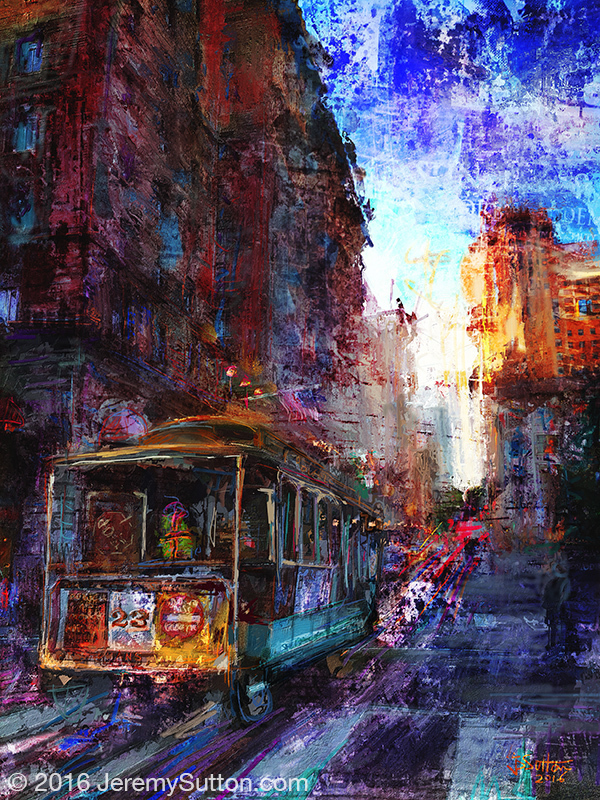 Also, if you’re interested in learning the techniques of painting with Corel Painter, you may be interested in joining my Corel painter Impressionism Workshop in San Francisco, July 25th to 28th, 2017, in San Francisco.